For digital signage advertising, Audio Spotlight directional audio technology is currently used throughout the world to reach consumers in settings that include public spaces, shopping malls, and retail outlets. In the Out Of Home Advertising industry, the Obie-winning Audio Spotlight has been used in conjunction with outdoor billboards, in-store retail activations and guerilla HD projection campaigns. Attract and excite shoppers with directional sound, without adding noise. Maintain peace and quiet, while still providing sound. Allow multimedia in difficult or sensitive areas. 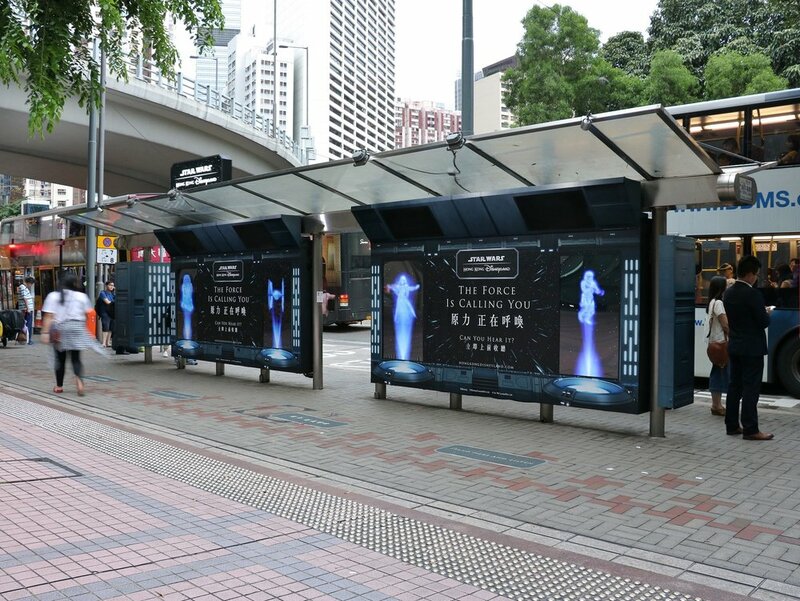 Gearing up for the opening of the new Star Wars: Tomorrowland Takeover attraction, Disneyland Hong Kong took to the streets of the city with an exciting digital signage advertising initiative. 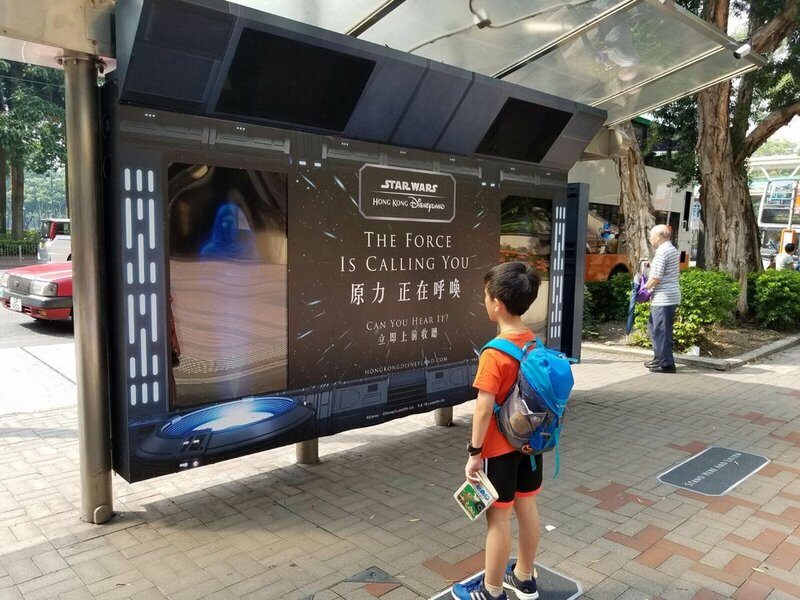 Bus shelters were converted into intergalactic message posts, as holographic images of popular Star Wars characters shared secret messages with the help of Audio Spotlight directional sound speakers, delighting fans of the franchise and everyday pedestrians alike. Each shelter included four unique screens, and every screen had its own AS-16i Audio Spotlightdirectional audio speaker mounted above, sending that character's sound to a specific point, such that none of the audio beams interfered with each other, or the surrounding environment. People were able to stand steps away from one another and hear completely different character messages, all with no sound pollution to the surrounding public area, and Disneyland was able to create quite a buzz. In an effort to support the latest technologies, and to keep up with customer demand for an engaging retail experience, Commercial Bank of Dubai has begun rolling out their new cashless branches around the UAE. 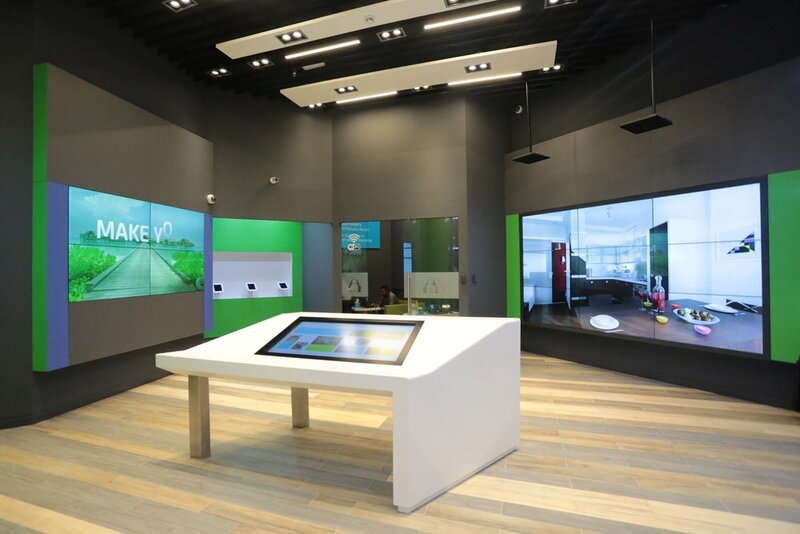 Within these forward-thinking branches are their self-service "Digital Kiosks" with which customers can learn about banking products and services, and even get information from a Virtual Assistant. 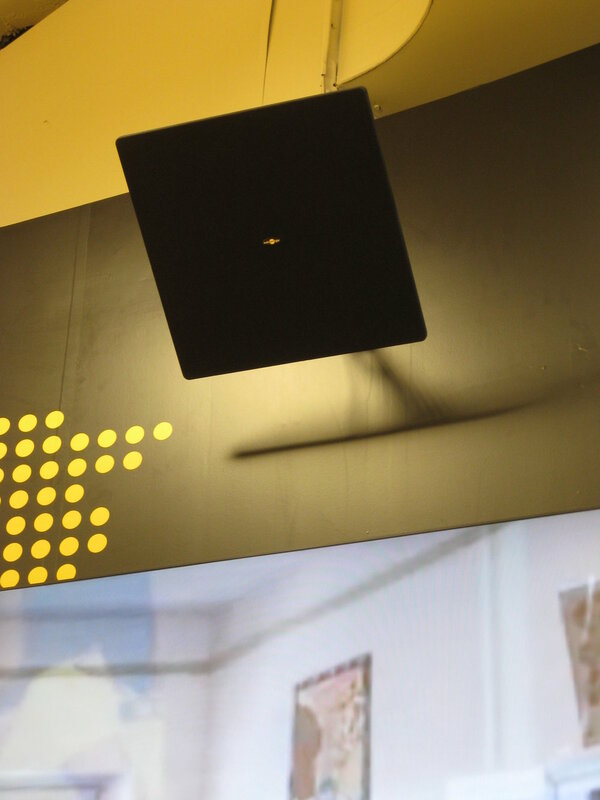 As the touch-enabled interactive video walls allow for more than one user at a time, two AS-16i Audio Spotlight directional sound speakers were connected to the media player, directing sound specifically to the customer interacting with that section of each video wall. 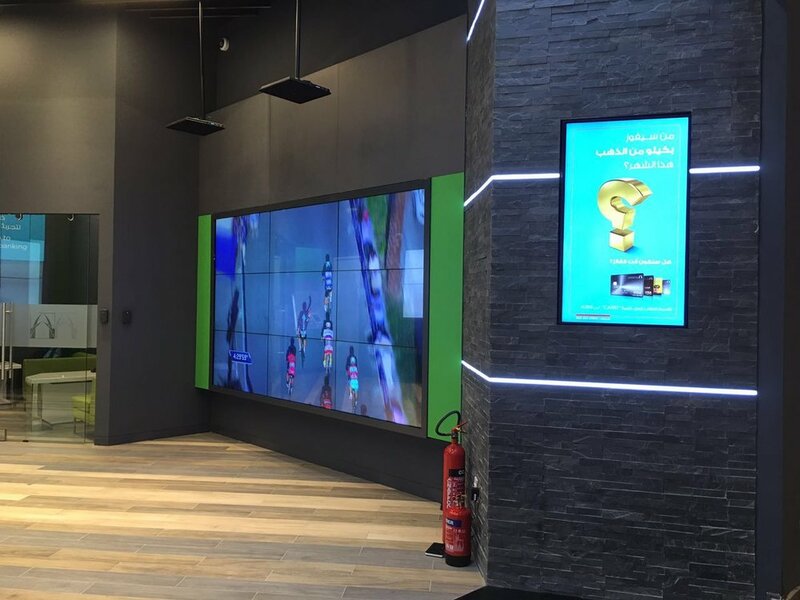 Isolating the sound eliminates any audio collision between what each customer is viewing, and using the Audio Spotlight, Commercial Bank of Dubai is able to provide customers with private, personalized, and engaging experiences in their successful Digital Kiosks. Leading convenience store chain 7-Eleven installed AS-16i Audio Spotlight directional sound technology into many of their locations throughout the southern United States to add sonic accompaniment to a brand new digital signage campaign. The video screens streamed a variety of weather, news, and promotional content, while the Audio Spotlight focused sound speakers handled the heavy sound lifting, ensuring the messages were easily audible to those customers at the nearby beverage stations, all without bothering shoppers or employees in adjacent areas. They had tried traditional speakers and other so-called "directional" sound systems before, but were unable to find a solution that provided "real" directivity. Ultimately, the Audio Spotlight directional audio technology proved to be the perfect fit for delivering focused sound for their signage, without adding unwanted audio bleed throughout their stores. Western Union's landmark location in Times Square is not a typical money transfer center. While all of the regular services offered by Western Union are available, the location also serves as a promotional and informational center for the company. This ability to provide two completely different experiences in one large open space is enabled by the use of Audio Spotlight directional sound technology. A large video wall, controlled by an interactive touch screen kiosk, displays information about the company's various philanthropic activities. Sound is provided by an AS-16i Audio Spotlight focused sound speaker, delivering the content only to the intended listeners, while enabling the customers and staff to do business in a quiet, professional atmosphere just a few feet away.